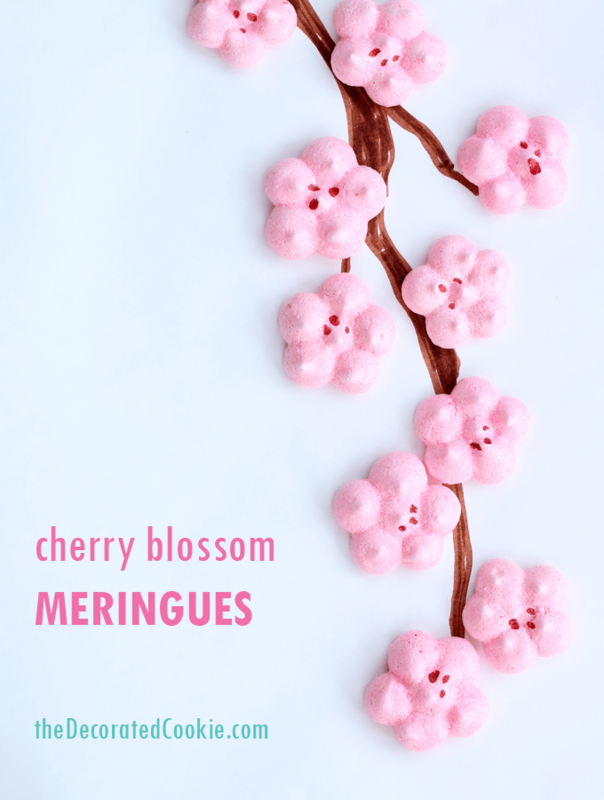 Orange-flavored cherry blossom meringues to welcome spring. I live in Washington DC, home to 3000 cherry trees that circle the Tidal Basin near the Jefferson Memorial. Every Spring, the minute that they bloom (really, they don’t bloom for very long) is a big, big deal here in Washington. 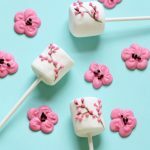 And every year I create some sort of edible cherry blossoms. 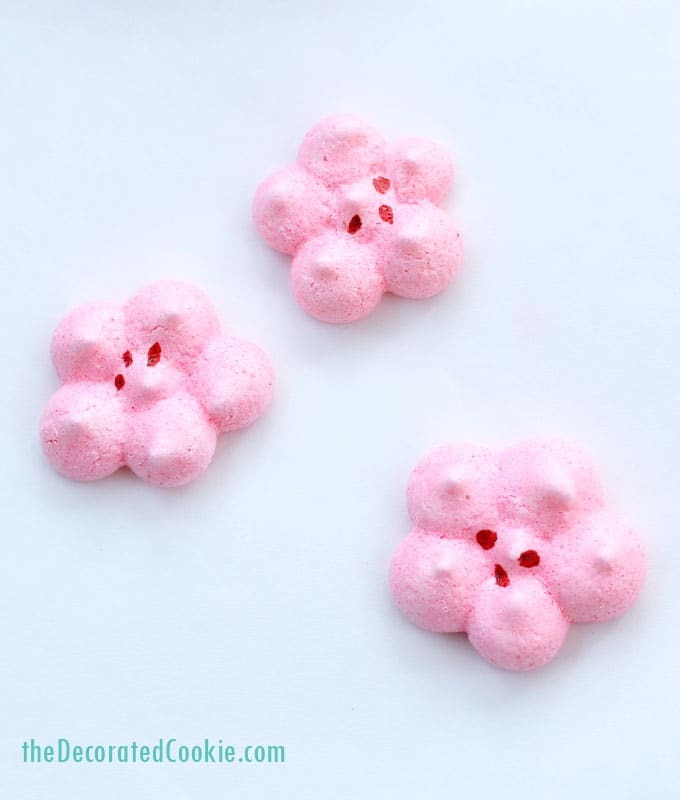 Cherry blossom marshmallows. 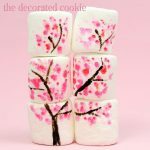 More cherry blossom marshmallows. 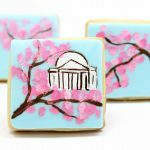 Painted cherry blossom cookies. 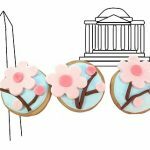 More cherry blossom cookies. 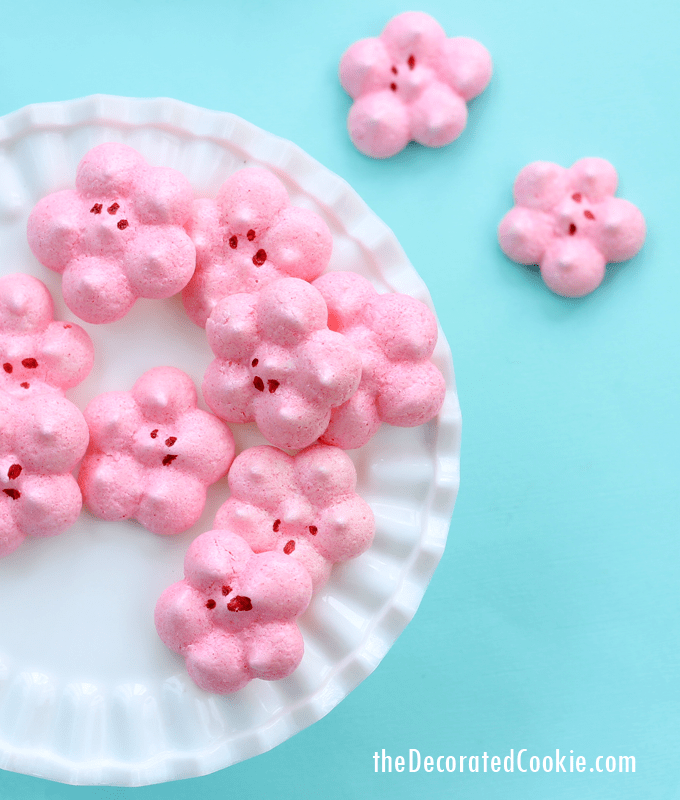 This year, I’m going for cherry blossom meringues. 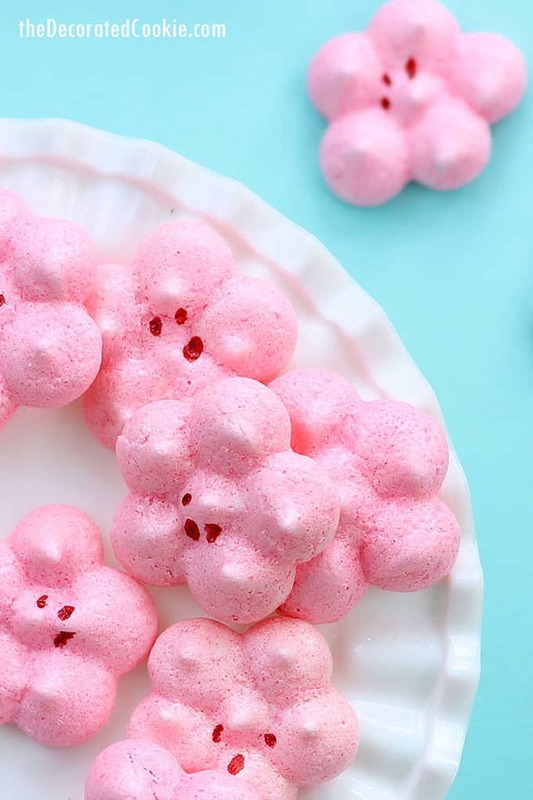 Meringues are simple to make and melt-in-your-mouth delicious. I added orange extract to mine for flavoring, but that’s optional. You can also add clear vanilla extract, peppermint extract or almond extract. You’ll find the how-tos here in this video. Find the full recipe below. Simply perfect for Spring. The little dots are optional if you want to skip that step, which would save you the red and white food coloring. You can also add dots with a red food coloring pen. Or just leave these beauts as is. Like these flowers? Check out my Spring treats Pinterest board for more. What to do: Preheat the oven to 200 degrees F. Line a baking tray or trays with parchment paper and set aside. Place the egg whites, cream of tartar and extract in a mixing bowl. With the wire whip of a standing mixer or a handheld electric beater, whip the mixture really really really well until it looks like snow. Slowly mix in the sugar. Add a drop or two of pink food coloring and mix well. Fit the decorating tip in the decorating bag and fill the bag with the meringue. Pipe flowers on the baking tray (five dots around a center dot). Place the tray in the oven and bake for 1 1/2 to 2 hours, or until the meringues are firm but not yet starting to brown. Turn off the oven, open the door a crack and let the tray sit in the warm oven for another two hours. Remove from the oven and let fully cool. If desired, add dots for accents. Mix a drop or two each of red and white food coloring. Add dots in the center with a small paint brush. Let dry. Preheat the oven to 200 degrees F. Line a baking tray or trays with parchment paper and set aside. Place the egg whites, cream of tartar and extract in a mixing bowl. With the wire whip of a standing mixer or a handheld electric beater, whip the mixture really really really well until it looks like snow. Slowly mix in the sugar. Add a drop or two of pink food coloring and mix well. Fit the decorating tip in the decorating bag and fill the bag with the meringue. Pipe flowers on the baking tray (five dots around a center dot). Place the tray in the oven and bake for 1 1/2 to 2 hours, or until the meringues are firm but not yet starting to brown. Turn off the oven, open the door a crack and let the tray sit in the warm oven for another two hours. Remove from the oven and let fully cool. If desired, add dots for accents. Mix a drop or two each of red and white food coloring. Add dots in the center with a small paint brush. Let dry. Hi Elizabeth, About a week if kept in a sealed container. It’s best to make sure they are really dried out well so they don’t become chewy. So be sure to leave them in the turned-off oven for a good while. This is such a fantastic idea. The cookies would make a beautiful addition to any party.